NEW Mag-Lite®'s MAG-TAC® LED flashlight. Two powerful modes, and Strobe mode. Pocket clip. 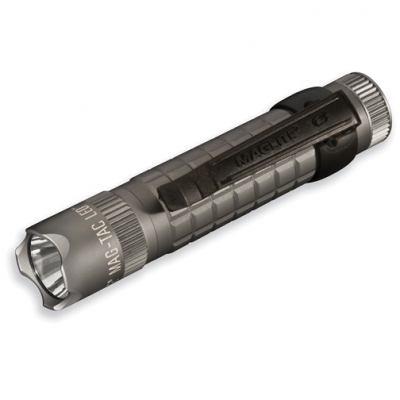 The crown-bezel version of the MAG-TAC® LED flashlight comes with a detachable pocket clip for your convenience. It features three lighting modes all selectable through Mag Instrument's tailcap-switch-activated "Quick-Click™" mode selector. Made in USA. 1. Full Power: For the brightest light. 320 lumens that carries 600 feet. 2. Strobe: High energy 12 Hz capability. 3. Momentary: The light stays on only while holding the switch button. Colors Available: Shown in the pull-down menu. We engrave your logo on the barrel or the smooth area by the tail cap. Laser Engraving - appears white. Price includes engraving one location. Barrel 9/16"H x 2"L. Tail 9/16" x 3/4"
Optional 2nd Location Engraving $1.50 (g) each plus set-up charge.